When the schedule for this week’s Food Network post for #SensationalSides was included in our seasonal calendar, I thought I might pass. At first ‘Kid Friendly Sides’ seemed a part of my past and certainly not something I had a handle on today. I must have been in a fog because while I’m not cooking for kids every day; I’ve sure got a passel of them that might be here at any given moment for a meal so they’re not in my past at all; they’re just not every day. With 10 little kids on my street of 10 homes my house is sometimes more the home of the Pied Piper. The kids often gravitate here. I’ve usually got a treat for them somewhere and I’ve even turned over my one spare bedroom (ostensibly my guest room) to be a playroom for them. One or two or four will just show up and it’s not unusual that I end up fixing them lunch or dinner. While an ice cream cone is always preferred for the main course; I’m a stickler about them eating a meal first and I’ve found one thing to be true. Breakfast pretty much works for any meal. One in particular is a picky eater but eggs, waffles, bacon, sausage…or a combination of all of them makes him happy so it’s what I’ll often do since all the other kids enjoy them too. Since I got a new waffle iron a few months ago, I’ve had some fun playing with it and while this recipe is almost too simple to even be called a recipe, it is a kid favorite. 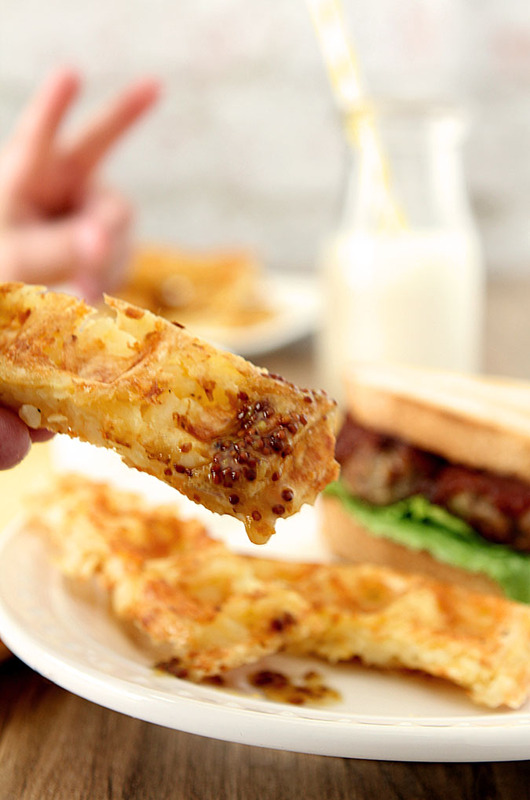 Some frozen hashbrowns are transformed magically into a waffle and if that hash-brown waffle has some cheese in it? What kid wouldn’t love that? Last week I had some leftover meatballs and a bag of the requisite hash-browns in the freezer and it turned into an easy meal. I sliced the meatballs for little sandwiches and cut the cooked hash-brown waffles into sticks for dipping in either ketchup or a maple mustard mixture I put together. The first time I tried these they sort of worked but I’ve found the key to real success is to include an egg in the mix; it helps to hold all the other components together. I kept this dish pretty simple; my little picky one, Lee (on the right, pictured above with his buddy), can detect an onion from a mile away or I might have included it so certainly add what you or your kids would love. 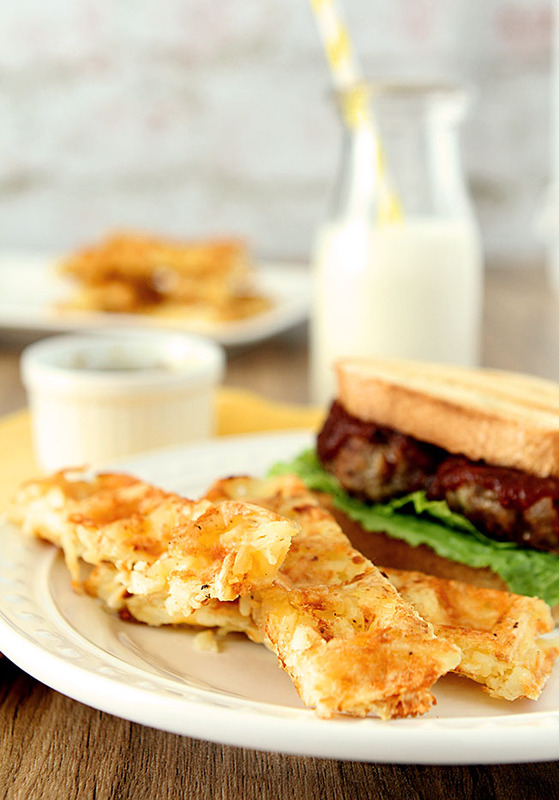 Bacon, cheese, onion, ham…you get my drift…whatever works with hashbrowns can be cut up and included in these Cheesy Hashbrown Waffles. Testimony to success? See those empty plates? They devoured them but I still paid them for their time as my testers. 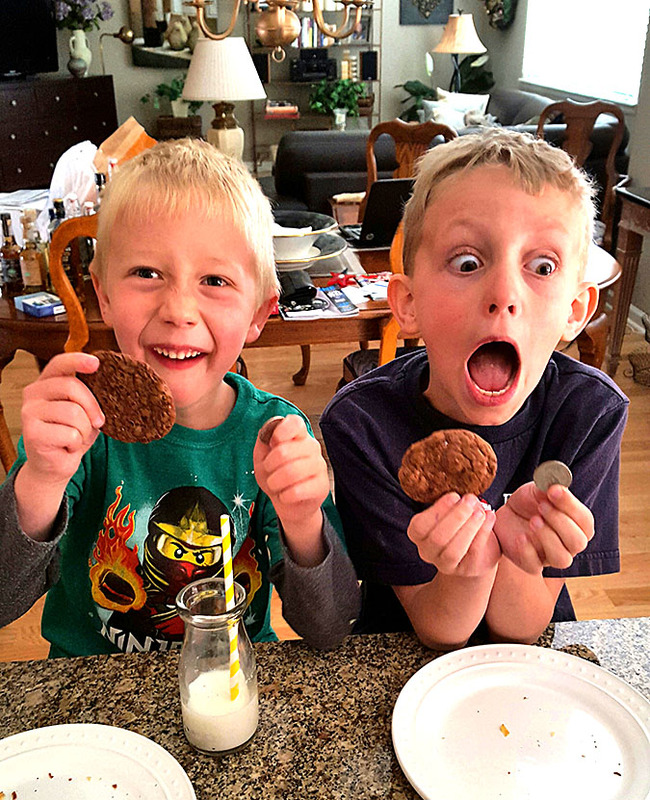 A quarter and a cookie; if only everyone could be so delighted right? I love this photo; those rabbit ears were Lee’s idea of helping take a photo. Turns out I loved it best. I also love the dip I made; while it may look like Honey Mustard it’s even better – how about Maple Mustard? Just seems more appropriate with a waffle hashbrown doesn’t it? I even took one that was leftover and used it for breakfast the next day…toasted it and put a fried egg on top and it was delicious. I know I know; I usually have recipes that are much more difficult than this one and really sometimes I wonder WHY??? Not just kid friendly but Barb friendly and I know you’ll love them too! 1 cup shredded cheese - I used a Mexican blend; not spicy but a blend of cheeses but cheddar and mozzarella are good too. 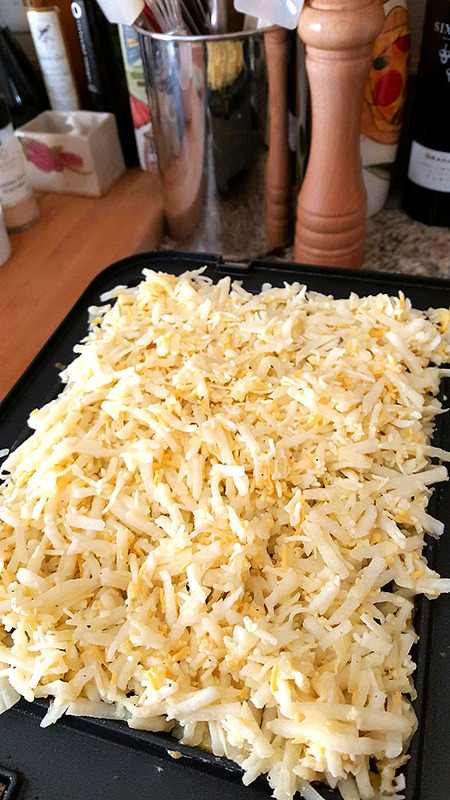 Beat eggs until thoroughly combined, add the cheese and hashbrowns and mix until well combined. Add salt and pepper to taste. Cook in waffle iron on medium high heat until brown cooked through. Combine maple syrup and whole grain mustard with a 2 to 1 ratio for how much you want; adding more syrup if necessary for your tastes. Serve on the side for dipping. I think best to cook this at a bit lower temp than normal for waffles since you are mixing frozen hash browns with other ingredients and they will need some time to thaw and cook before browning on the outside. Want some more kid friendly dishes? Try these on for pint size! I’d love to be a kid on your street! 🙂 So much fun. And good food — even more important! Anyway, these look wonderful for kids of all ages. Thanks! I love them back too…very lucky they are all such sweet kids! Trust me, we all loved these; playing with the waffle iron is fun!